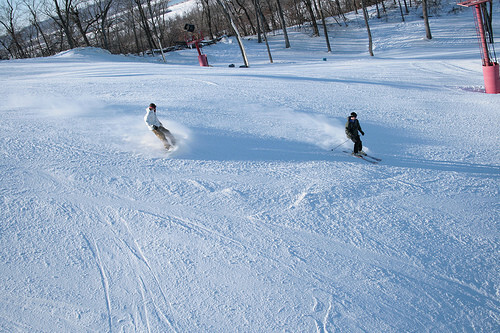 Snow Creek, located in Weston, Missouri, features ski and snowboard facilities as well as a tube park. The ski area has a 300 foot vertical drop, 2 triple chairlifts, 1 double and 3 rope tows. The ski area also has 60 snowmaking machines to ensure snow quality throughout the season. Their 10,000 square foot base lodge has a bar and loung upstairs as well as a cafeteria downstairs for dining. The historic town of Weston has plenty of lodging options for guests to enjoy. Ski Lodge: 10,000 square feet with Bar & Lounge upstairs. Cafeteria, Rental Shop, Ski Patrol First Aid Facility, Ticket, Souvenir, Ski School Lesson Center, Reception & Group Sales Downstairs. Ski School Lesson Center: PSIA certified, 60 instructors, group and private ski & snowboard lessons for all abilities. Get Snow Reports, Powder Alerts & Powder Forecasts from Snow Creek straight to your inbox!